Or stare without moving an eyelash. This or stare without moving an eyelash was the method of Meher Baba. For years together he was staring just at the ceiling of his room. For years together he was just lying dead on the floor, staring at the ceiling without moving an eyelash, without moving his eyes. He would lie down for hours together, just staring, not doing anything. Staring with the eyes is good, because you become fixed again in the third eye. And once you are fixed in the third eye, even if you want to move the eyelids you cannot; they become fixed. Meher Baba attained through this staring, and you say, “How with these small exercises…?” But for three years he was staring at the ceiling not doing anything. Three years is a long time. Do it for three minutes and you will feel as if you have been lying there for three years. Three minutes will become very, very long. It will look as if time is not passing and as if the clock has stopped. Meher Baba stared and stared and stared. By and by thoughts ceased, movement ceased, and he became just a consciousness, he became just a staring. Then he remained silent for his whole life. He became so silent inside by this staring that it became impossible for him to formulate words again. Meher Baba was in America. There was one man who could read others’ thoughts, who could do mind readings, and he was really one of the rarest mind readers. He would close his eyes, sit before you, and within a few minutes he would become attuned with you and he would begin to write what you are thinking. Thousands and thousands of times he was examined, and he was always right, always correct. So someone brought him to Meher Baba. He sat there, and this was the only failure of his life – the only failure. But then again we cannot say it was a failure. He tried and tried, and he began to perspire, but he couldn’t catch a single word. Pen in his hand, he remained there and said, “What type of man is this? I cannot read because there is nothing to read. This man is absolutely vacant. I even forget that someone is sitting there. After closing my eyes, I have to open them again and look to see whether that man is there or whether he has escaped. So it is difficult to concentrate, because the moment I close my eyes I feel I am being deceived – as if that man has escaped and there is no one before me. I have to open my eyes again, and I find that this man is there. And he is not thinking at all.” That staring, that constant staring had stopped his mind completely. With growing desirelessness, sometimes the person becomes outwardly inactive. Is it lethargy and dullness? Why does it happen? Many things are possible, and it will depend. Certainly many desires will drop and many actions also. Those actions which were just caused by desires will drop. If I was running for a particular desire, how can I run if the desire has dropped? My running will stop. At least the same running on the same route will stop. So when a person becomes desireless, at least for an interim period, for an interval – and how long it will be will depend on the individual – he will become inactive. The desires will have dropped – and all the actions that he had been doing were concerned with desires, so how can he continue? They will drop. But by dropping desires and actions, energy will be accumulated – and now energy will begin to move. When it moves, how it moves will vary from individual to individual, but now it will move. There will be a gap, an interim period, an interval. This I call a pregnancy period. The seed is born, but now it will gestate for at least nine months. And it may seem strange, but it happens. This nine months period is meaningful. Near about this, eight months or ten months, will be the interim period, and you will just become inactive. This inactivity will also vary. Someone may become so inactive that people may think that he has just gone into a coma. Everything stops. For Meher Baba it happened like that. For one year he was just in a coma. He couldn’t even move his limbs. Action was far off; he couldn’t stand up because even the desire to stand had gone. He couldn’t eat; he had to be forced. He couldn’t do anything! For one year continuously he became just helpless – a helpless child. This was a pregnancy period, and then, suddenly, a different man was born. The man who became inactive was no more: a new energy – energy accumulated. Lives and lives of dissipated energy create this gap – because you do not have enough energy. When desire is not there to invoke, provoke, stimulate, you just drop. Your energy is not really energy, but just a pushing and pulling. Anyhow you go on running because the goal seems just nearby. A few moments’ endeavour more and you will reach! You pull yourself on; somehow you carry yourself and run. But when the goal is dropped, when there is no desire, you will drop. An inactivity will be there. If you can be patient in this inactivity period, after it you will be reborn. Then energy will begin to move without desires. But I say it depends. It may happen suddenly as it happened for Meher Baba: that was a sudden case. It happened in Bombay. It happened by a kiss from an old lady, Babajan. Meher Baba was just passing, coming back from his school. Babajan was an old Sufi mystic, an old lady who was just sitting under a tree for years and years and years. Meher Baba was just coming, and Babajan called him. He knew this old lady. She was sitting for years under the tree, and he had passed by that street daily on his way towards his school and towards his home. She called and he came near. She kissed him – and he dropped as if dead just there. Then he had to be carried home. For one year continuously the kiss remained on him and he was in a coma. It may happen suddenly like this. Mm? This was a great transfer, and Babajan died afterwards because she had just been waiting for this moment to give someone the whole energy. This was her last life, and there was not enough time even to explain what she was giving. And also, she was not the type to have explained. She was a silent mystic. She had not touched anybody for years. She was a only waiting for this moment when she was to kiss someone and the whole energy was to be transferred in a single transfer. Before this she had not even touched anyone, so this touch was to be total. And this child was simply unaware of what was going to happen. He was ready – otherwise this transfer would not have been possible – but he was not aware. He had worked through his past lives. He was just coming up. He might have become aware later on, but just now he was completely unaware. This happened so suddenly that he had to go again through a second pregnancy. For one year he was as if not. Many medicines were given; many, many doctors and physicians tried to help, but nothing could be done. And the woman who could do something, she disappeared, she died. After one year he was a different man – totally different. If it happens so suddenly, then it will be a deep coma. If it happens through some exercises, then it will never be so deep a coma. If you are doing awareness exercises, meditation, then it will never happen so suddenly. It will come so gradually, so gradually, that you will never even become aware of when it has happened. By and by, inactivity will be there, activity will be there, and very gradually inside everything will have changed. And the desire will drop, the activity will drop, but no one will ever feel that you have been lethargic or that you have become inactive. This is the gradual process. So those who follow yoga or any method will not feel the suddenness. There are also methods in which sudden happenings become possible, but one can be prepared. Babajan never prepared this boy; she never even asked his permission. It was a one-way affair. She just transferred the energy. Zen monks also transfer, but before transferring they prepare the ground. A person can be made ready to receive the energy, then this reaction will not be there. He may feel lethargy for some days, for some months, but no one will feel outside that inside everything has become inactive. But that needs preparation, and that can happen only in schools. And when I say “school”, I mean a group working. Babajan was alone; she never made anyone her disciple. There was no school; there was not a following in which she could have prepared anyone. And, also, she was not the type. She was not the teacher type; she couldn’t teach. But she had to give to someone, to whomsoever passed and she felt: “Now is the moment, and this one will be able to carry it,” so she could just deliver it. So it depends. Inactivity is bound to be there – more or less, but it will be there, a period will be there. And only then can you be reborn, because the whole mechanism has to change completely. The mind drops, old roots drop, the old habits drop, the old association of consciousness and desires, consciousness and mind, drops – everything old drops and everything has to be new. A waiting is needed, patience is needed. And if one is patient, one has not to do anything: just to wait is enough. The energy begins to move by itself. You just sow the seed and then wait! Don’t be in a hurry; don’t go every day to pull the seed out and see what is happening. Just put it inside and wait. The energy will take its own course. The seed will die, and the energy will sprout and will begin to move. But don’t be impatient. One has to wait. And the greater the seed, and the greater the possibility, the potentiality of the tree that is going to be, the more will be the waiting. But it comes. It comes! The deeper the waiting, the sooner it comes. Meher Baba has talked about God descending in man (Avatar, Rasool, Christ) and man rising to be God (The Perfect Master, Sadguru, Qutub, Teerthankara). Would you please talk to us about the same. God is. He neither ascends nor descends. Where can he ascend to and where can he descend to? God is all. There is nothing in to which God can ascend or descend. There is nobody else other than God. All that is, is divine. So the first thing: there is no ascendence, no descendence. But when Meher Baba says it, there must be some meaning in it. The meaning is something quite different. Let me explain it to you. God is, remember. God is a pure isness, pure existence, and there is nowhere for God to go or come. The whole is full of him. He fills his existence, one thing. Second thing: but Meher Baba must be true. Then there must be some other meaning to it—not God descending and ascending. What can be the meaning? The meaning is there are two ways of man approaching God. What do I mean by “man” when God is the only reality? Man is the God who has forgotten that he is God; man is a God who has forgotten himself. Man can remember his godliness in two ways. One way is that of surrender, devotion, love, prayer; another way is that of will, effort, meditation, yoga. If a man tries to work his way through will, then he will feel he is ascending towards God or he is reaching towards God through his will. Hence Jainas call the man who attains to godliness a Teerthankara. Teerthankara means consciousness has reached the peak; man has arrived by ascending, as if there has been a ladder, the ladder of the will, the ladder of effort and yoga. So is the concept of the Buddhas; that too is the path of will. Avatar means God descending; that is another approach, when a man surrenders. He cannot ascend. He simply opens his heart and waits, prays and waits, and suddenly he starts feeling a stirring in his heart. Certainly he will see “God has descended in me.” Avatar means descendence, God coming down. Mahavir went up. For Meera, God came down. But God never comes down, never goes up. God is where he is. But your experience will be different. If you try hard to achieve God, you will go higher and higher and higher; naturally you will feel the God hidden inside you is arising, rising up, reaching to the zenith. But if you surrender, nothing is arising in you. You are where you are, you simply wait in deep prayer, in deep love, in deep trust, and one day you find God is descending in you, coming from above. These are the experiences of two types of seekers. It has nothing to do with God. It has something to do with the seeker and his way: will or surrender, effort or prayer, yoga or Bhakti. So the religions which believe in Bhakti, in devotion … Christianity says Christ comes from God. That is the meaning of saying that he is God’s son — he comes from above, he has been sent. And that is the meaning of Mohammed — he is a prophet, a messenger, Paigambar. Paigambar means a messenger who comes from above, brings the message. He does not belong to this world; he comes like a ray of light into the darkness. And so is the concept of the Hindus’ avatar–Krishna, Ram — they come, they come into the world. The Buddhist, the Jaina concept is just the reverse. They say there is no God to come, and God is not a father and he cannot have a son. These are all very childish concepts for them. And if you look through their eyes they are; these concepts are childish, very anthropomorphic, man-centered. You create God in your own image, as if God also has a family. He has a family — the Trinity: God the Father, Christ the Son, and the Holy Ghost. The Holy Ghost must be a woman; otherwise the family will not be exactly as it should be. But why don’t Christians call the Holy Ghost a woman? Male chauvinism. They cannot make a woman also part of the Trinity; it is difficult for them, very difficult for them. So to what have they reduced their God? It seems to be a homosexual family: all men, not a single woman there. It looks ugly. But my feeling is that the Holy Ghost must be a woman. We create God in our own image. Jainas and Buddhists say that there is no God and there is no God’s family and nobody comes from there. Then what has one to do? One has to arise. God is in you like a seed, as a tree arises from the earth and goes higher and higher. God is not like rain falling, but a tree arising. Man has the seed. Man is potentially God. So when you work hard, you start growing. These are the two concepts. That’s why Meher Baba says, “… God descending in man (Avatar, Rasool, Christ) and man rising to be God (the Perfect Master, Sadguru, Qutub, Teerthankara).” But it has nothing to do with God. With growing desirelessness, sometimes the person becomes outwardly inactive, is it lethargy and dullness? Why does it happen? But by dropping desires and actions, energy will be accumulated – and now energy will begin to move. When it moves, how it moves will vary from individual to individual, but now it will move. There will be a gap, an interim period, an interval. This I call a pregnancy period. The seed is born, but now it will gestate for at least nine months. And it may seem strange, but it happens. This nine months period is meaningful. Near about this, eight months or ten months, will be the interim period, and you will just become inactive. This inactivity will also vary. Someone may become so inactive that people may think that he has just gone into a coma. Everything stops. For Meher Baba it happened like that. For one year he was just in a coma. He couldn’t even move his limbs. Action was far off, he couldn’t stand up because even the desire to stand had gone. He couldn’t eat; he had to be forced. He couldn’t do anything! For one year continuously he became just helpless – a helpless child. This was a pregnancy period, and then, suddenly, a different man was born. The man who became inactive was no more: a new energy – energy accumulated. Lives and lives of dissipated energy create this gap – because you do not have enough energy. When desire is not there to invoke. provoke, stimulate, you just drop. Your energy is not really energy, but just a pushing and pulling. Anyhow you go on running because the goal seems just nearby. A few moments’ endeavour more and you will reach! You pull yourself on; somehow you carry yourself and run. But when the goal is dropped, when there is no desire, you will drop. An inactivity will be there. If you can be patient in this inactivity period, after it you will be reborn. Then energy will begin to move without desires. But I say it depends. It may happen suddenly as it happened for Meher Baba: that was a sudden case. It happened in Poona. It happened by a kiss from an old lady, Babajan. Meher Baba was just passing, coming back from his school. Babajan was an old Sufi mystic, an old lady who was just sitting under a tree for years and years and years. Meher Baba was just coming, and Babajan called him. He knew this old lady. She was sitting for years under the tree, and he had passed by that street daily on his way towards his school and towards his home. She called and he came near. She kissed him – and he dropped as if dead just there. Then he had to be carried home. Babajan was alone; she never made anyone her disciple. There was no school, there was not a following in which she could have prepared anyone. And, also, she was not the type. She was not the teacher type; she couldn’t teach. But she had to give to someone, to whomsoever passed and she felt: “Now is the moment, and this one will be able to carry it,” so she could just deliver it. An audio file of this discourse can be downloaded from Osho.com, or you can read the entire book online at the Osho Library. 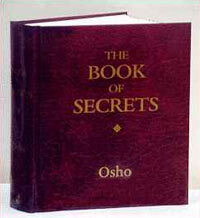 Both audio and pdf files can be downloaded from Osho World.